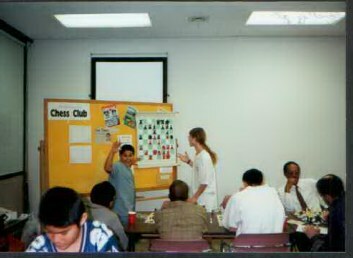 The December 1999 Expo Chess Tournament (4 round Swiss) was held December 5 and 12, 1999 at the Exposition Park Regional Branch, Los Angeles Public Library, 3665 South Vermont Ave., Los Angeles, CA 90007. Because of the large number of children participating, this tournament was divided into an Open division and a Junior Division. Winners of the Open Division were William Morriss (1st Place), Arthur Likman (2nd Place) and Simon Howard (3rd Place). Jonathon Jaines, Alex Jaines, and Juan Lopez, tied for 1st, 2nd, and 3rd, in the Junior Division. For further information contact the tournament director William Morriss (213-764-6553, email: william_morriss@hotmail.com).